Seasoned Search and Rescue volunteer and debut novelist M.L. Rowland takes on the subject she knows best and brings the first in a thriller series sure to maintain your edge-of-the-seat spot. Gracie Kincaid is a professionally serious volunteer with the Timber Creek Search and Rescue team, the largest county in the country. And while she may be ordered and disciplined in her role, her youthful and feisty vigor can sometimes get just a little bit in the way of her personal life, if you can call failed relationships and a string of job-hopping as one. In this first installment in the Search and Rescue mystery series, Gracie's partnered up with Cashman, a rogue and reckless volunteer who is given the lead to search for the missing British actors of a movie being filmed locally and who have somehow gotten lost in Southern California's wilderness on Thanksgiving Day. When Gracie and Cashman finally find one of the missing persons, he's been a little bit knocked around and seems to slightly remember being attacked on the trail. As Cashman takes the radio and hike out to report their position, Gracie does her best to not worry that the only link to the rest of the team, and ultimate rescue, didn't just go with him. With a possible killer in the mountains to contend with, Gracie has to keep Rob Christian, world-famous actor, alive and well at all costs. This isn't my typical reading choice, but I was in the mood for something different. Different, thrilling, and one I could learn from. So when I got the offer to read M.L. Rowland's debut, I was more than happy to accept it. With survival tactics weaved into the story, Gracie's cute and somewhat rebellious self (although never about her SAR volunteer work), was incredibly fun to read. It'll keep you distracted in a busy airport, and engaged throughout. My only wish was that I found out earlier on the depths of Gracie's life and why she's built the way she is, especially why the defiant and personal wall set up with her family is so big. The work was incredibly interesting to learn, and I enjoyed the twists and turns and survival knowledge thrown in, but I wanted to understand more about Gracie and really get into her past. It wasn't until the last few chapters that I got that peek, which easily painted the full picture of why Gracie is the way she is. M.L. Rowland is an author to keep on the watch list; as with any author, there is no doubt she's only going to just get even better, and more thrilling, with each step along the Search and Rescue mystery trail. FTC Disclosure: I accepted this book from the publisher in order to provide an honest review. M.L. Rowland is an experienced Search and Rescue volunteer of twelve years, participating in hundreds of missions and trainings, including technical ropes rescues, helicopter insertions and evacuations, and searches for lost children, hikers, snowboarders, mountain bikers and criminal evidence, in alpine, desert and urban environments. She served as the team’s Training Officer and participated in community events and public speaking engagements. Trained in land navigation, and desert and winter survival, including avalanche awareness and self-arrest, she holds a certification in tracking from the State of California. Rowland also served as a member and on the Board of a Colorado County Sheriff’s Department All-Hazards Incident Management Team (IMT) which manages local search and rescue operations, brush and wildfires, planned community events and other critical incidents. Rowland is an avid political activist, naturalist and environmentalist. She is an accomplished painter and loves to snorkel. She has traveled to all fifty states in the US and also throughout the world. 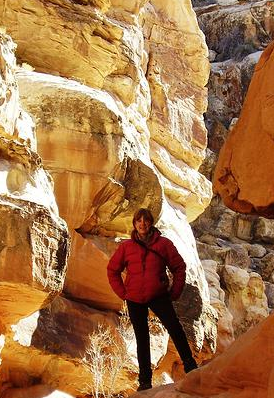 As often as possible, she hikes and explores the slot canyons of Utah. Rowland lives with her husband, Mark, and their chocolate lab, Molly, at the foot of the Sangre de Cristo Mountains in south-central Colorado. I'll keep an eye out for Rowland's work! Your readers might enjoy learning about a new organization starting up. It's called the Mexico Mystery Writers Cartel, and I'm pleased to be a founding member. Murder in Mexico is my series of eleven mysteries set in and around the upscale expat colony of San Miguel de Allende. Artist Paul Zacher is drawn into crime investigation because ‘he might see things differently.’ Maybe it’s time for the rich humanity of Mexico to show through all the narco headlines! Ready for the real Mexico, beyond the phony news reports? Take a look at this suspenseful and often funny series, available in Print, Kindle, Nook, & Kobo. Start with ‘Twenty Centavos’ by trying a sample on my website. The author certainly has an impressive background in Search & Rescue. Interesting!